This past week has been like furniture painter Christmastime for me! I’ve been bursting at the seams with excitement over my newest business opportunity. About a month ago, I was able to double the size of my booth at Morgantown Market. 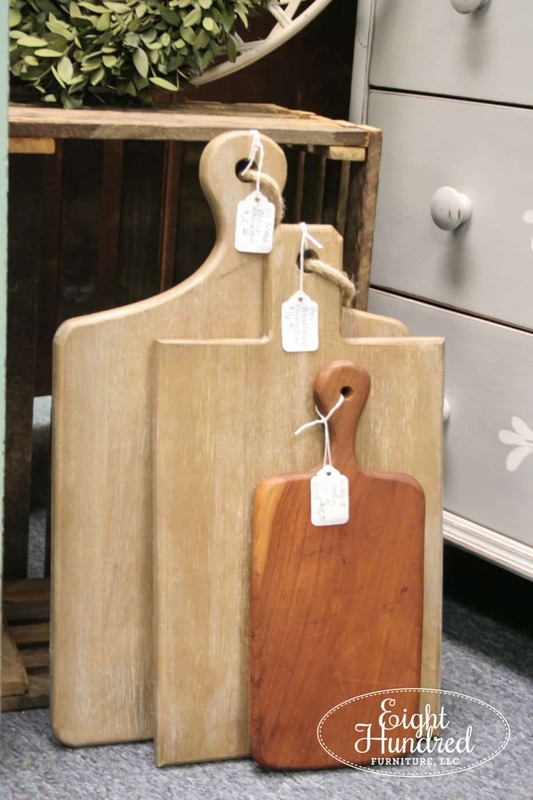 For a furniture person like me, that equals oodles of pieces and smalls! Since January, I’ve been hard at work finding gorgeous pieces, fixing them up, and storing them in our 830 square foot apartment (thanks Marc). 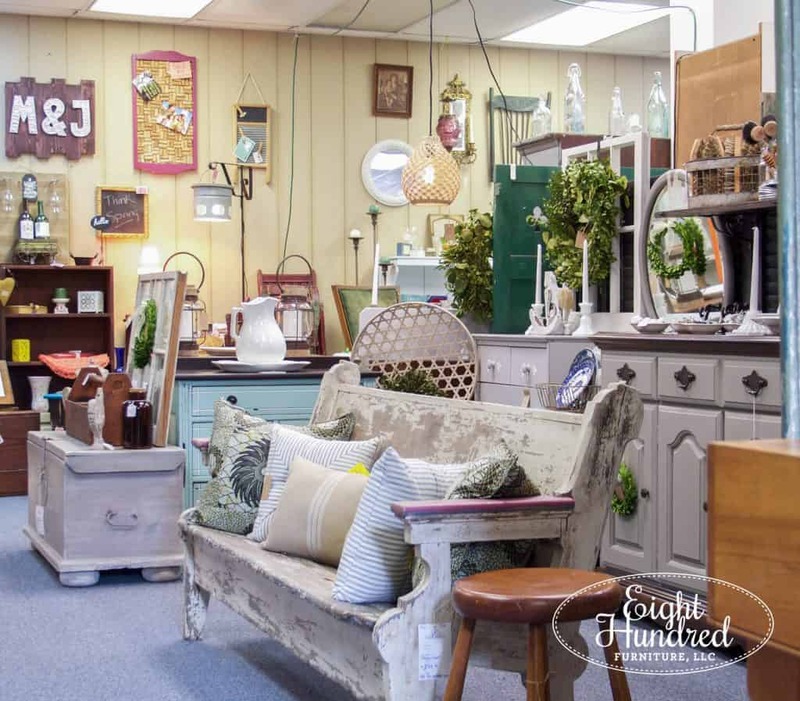 This past Wednesday, I was finally able to set up my new space and I’m beyond excited to give you a virtual tour. My booth is located on the second level of Morgantown Market. When you come in at the street level, that’s the first floor. There are stairs to go down to the second level, which is where I am. There is a third lower level as well as a few rooms that branch off on either side. Needless to say, if you’re looking for a place that’s stocked with fantastic dealers, you should come visit! 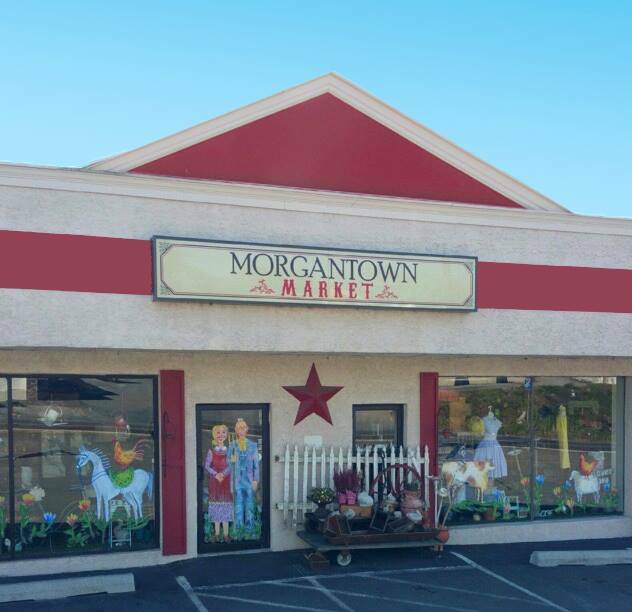 Morgantown Market is located right off of the PA Turnpike at the Morgantown exit (go figure). It’s shaped like a “L”. 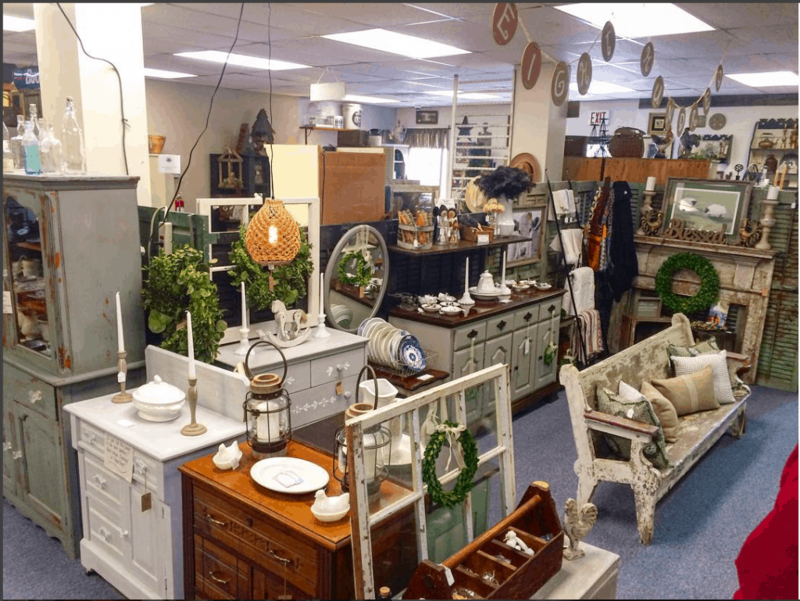 I have a rectangular space and it wraps around a corner into an aisle. Does that make sense? Just make an “L” with your left hand and you’ll get the idea! If you turn into my space, you’ll see a gorgeously crusty mantle from the 1700’s. 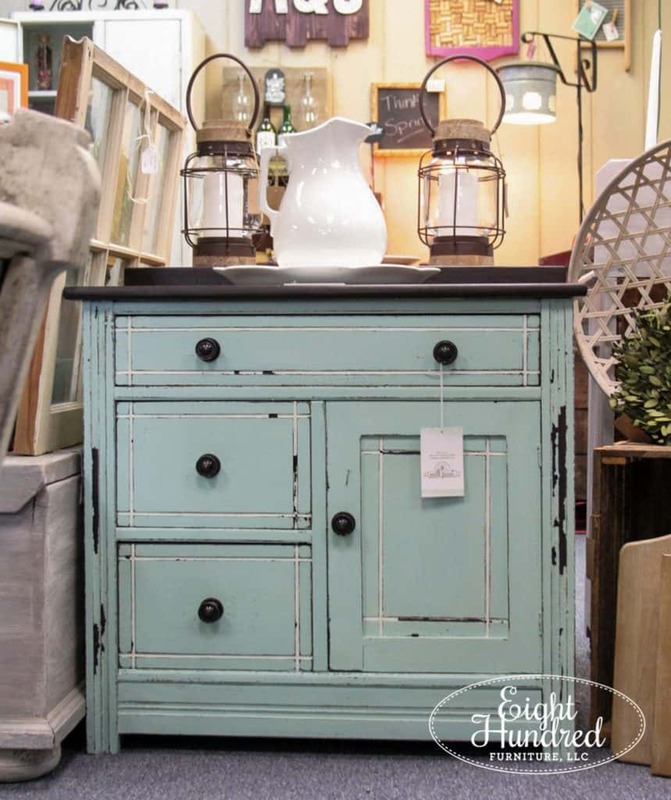 This pretty piece was sealed with Miss Mustard Seed’s Tough Coat, so you don’t have to worry about any chipping paint in your home. You can read about that makeover here. On top of the mantle, I have a few brass roosters that have been revived withHemp Oil. I also have one of Miss Mustard Seed’s Society 6 pieces. 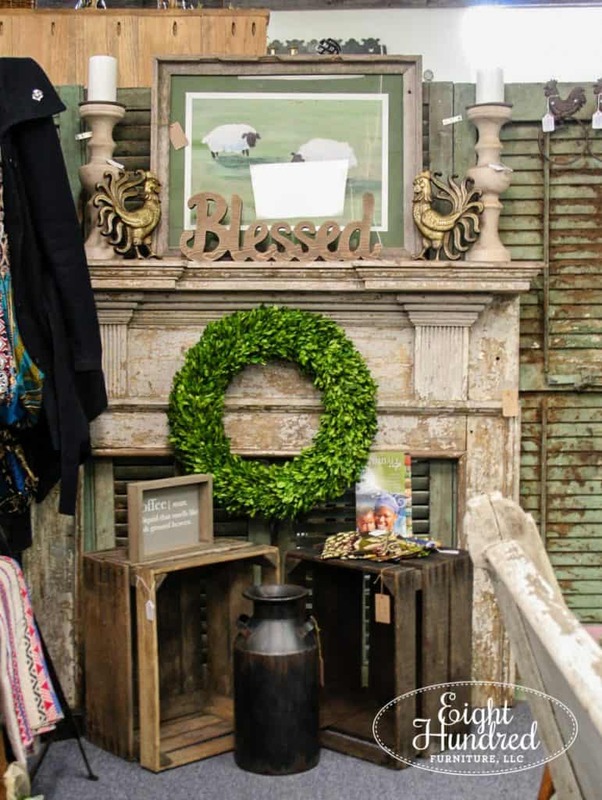 These sheep were photographed from one of her landscape dressers, and I’ve turned the print into a piece of art for your farmhouse home! In the middle, I created a bit of an island with this old crusty bench. I found this beauty up in Hanover during my Christmas trip to Marian’s home. I couldn’t believe my eyes when I saw it nestled underneath pine tree boughs. It fit perfectly in the back of The Marshmallow (our truck) and after a few coats of Tough Coat, it’s also sealed and protected for your home. 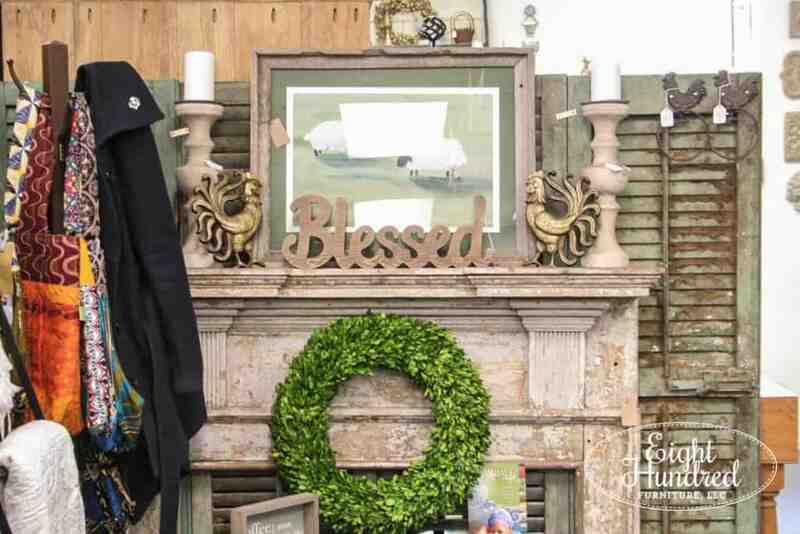 Tough Coat is not for outdoor use, so this piece would best be used in a hallway or entranceway. 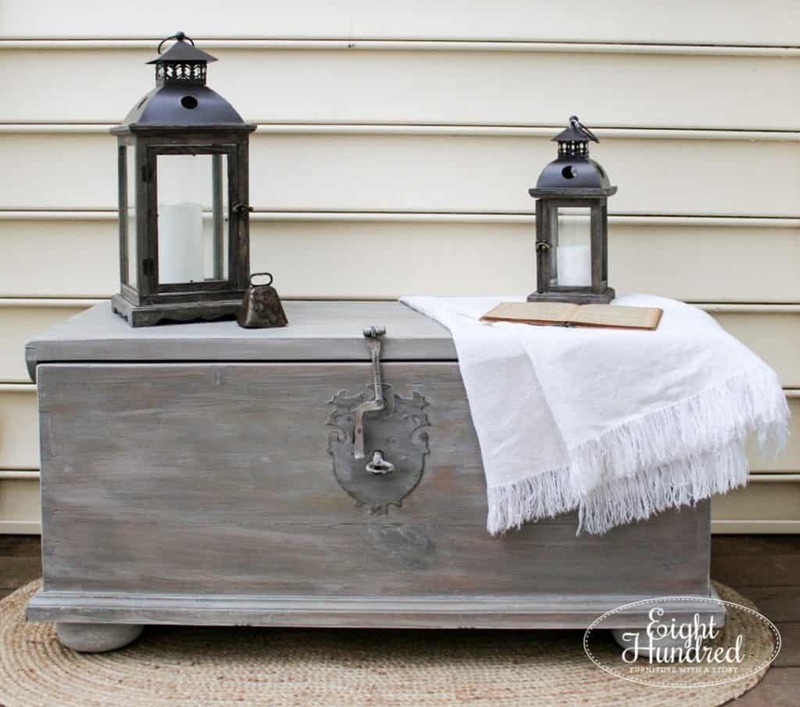 It could go out on your porch as long as it’s covered and not exposed to the elements dirtectly. The arms on this bench were painted a pinkish red color originally, so I left them alone. 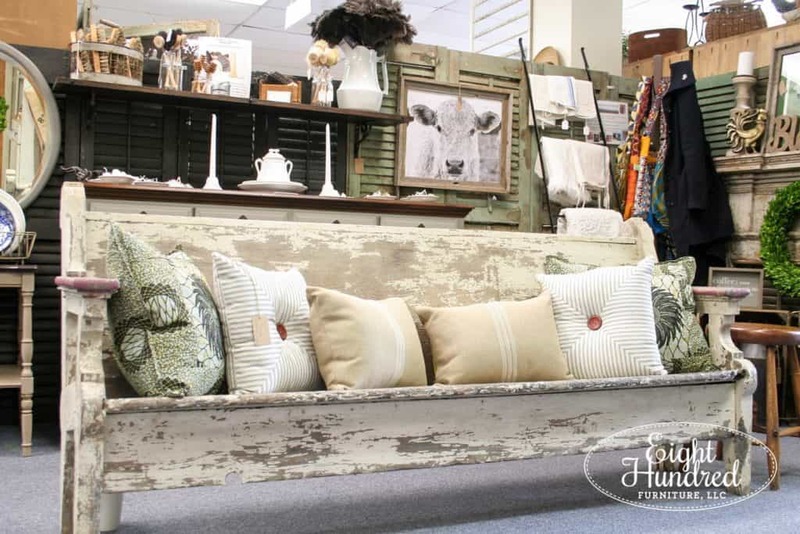 The pillows on the very ends are from Timbali Crafts. I carry a selection of these textiles in my booth including handbags, clutches, and mega totes. The women who create Timbali Crafts are all volunteer cooks at community-based feeding centers (called Care Points) throughout Swaziland. My church has adopted one of these Care Points and we take frequent trips to visit them every year. Swaziland has the highest HIV/AIDS infection rate and lowest life expectancy in the world. Think about that. IN THE WORLD! The Timbali women help feed more than 2,500 children each day. In Siswatti, the word “Timbali” means flowers. It’s also the word used to translate ‘lilies’ in Matthew 6, where Jesus talks about how we don’t have to worry about our basic needs because we’re His children and He can take care of us better than anyone else can. If you had to help feed more than 2,500 children a day, I’m sure this verse would bring you comfort too! 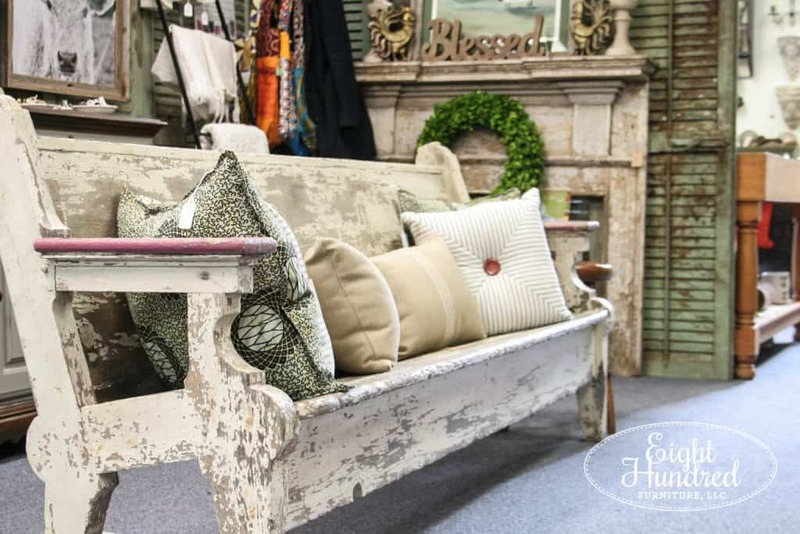 In addition to the Timbali pillows, I also have some that were made from genuine antique mattress ticking and some reproduction grain sack fabric. 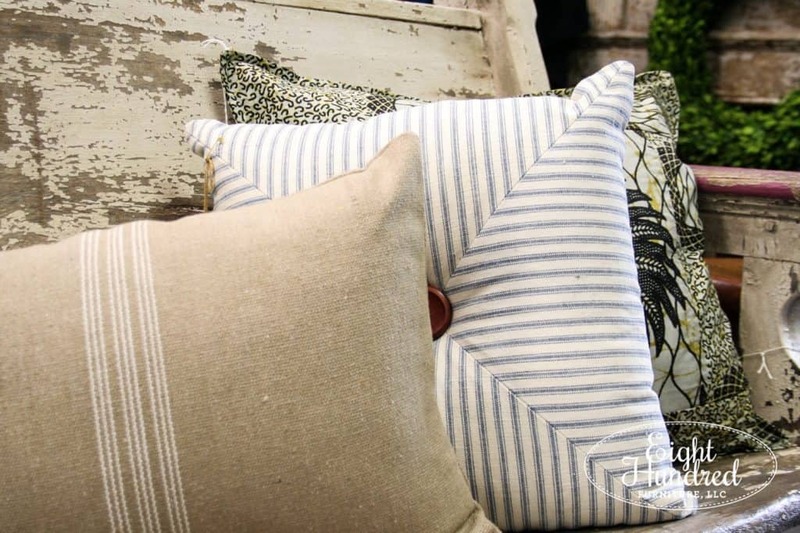 They would make the perfect accent pillows on your sofa or bed. Behind the bench, I have my MMSMP server in “Schloss”. 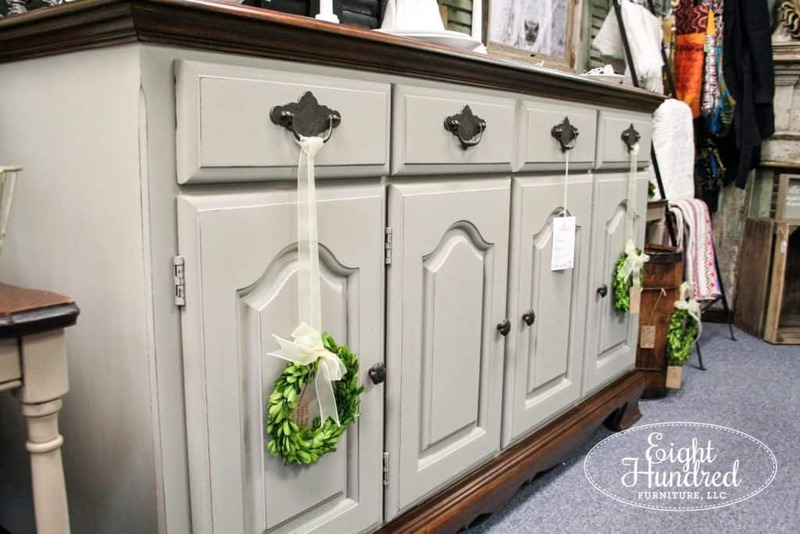 This color is a fantastic gray color that has warm undertones. 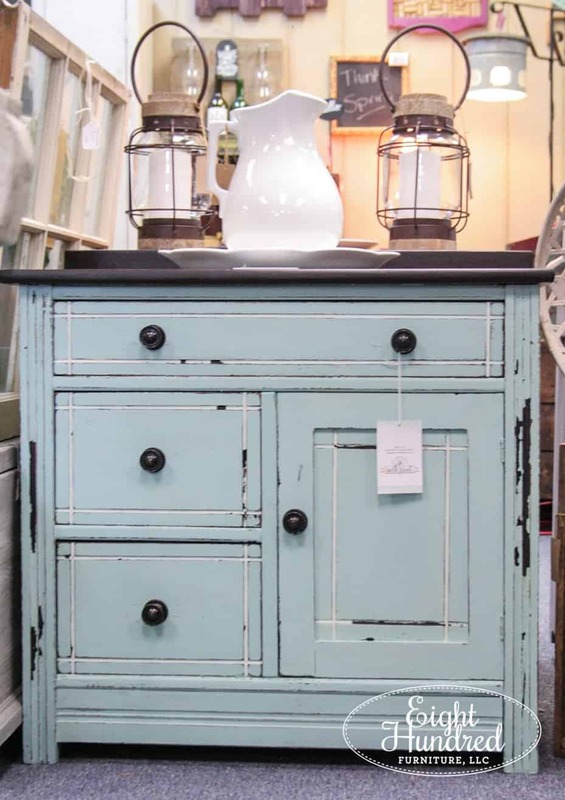 It’s a handsome piece and has tons of built-in storage for your home. 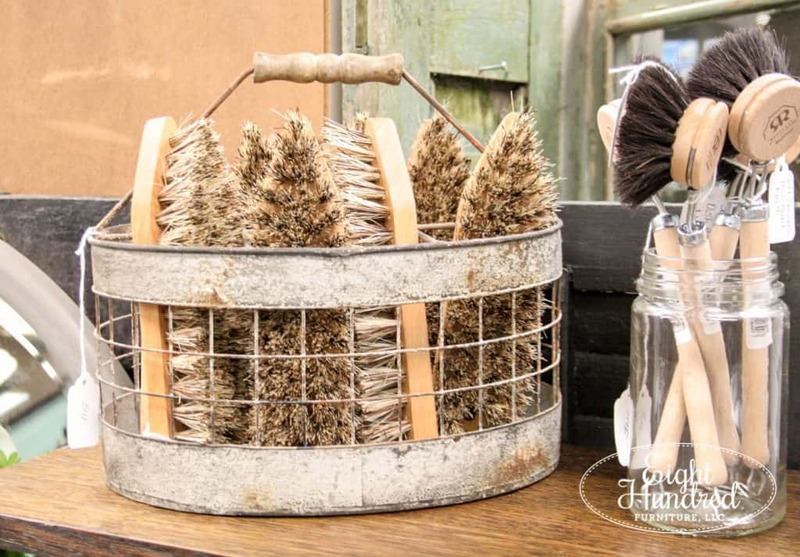 Above the server, I have an assortment of German household brushes. 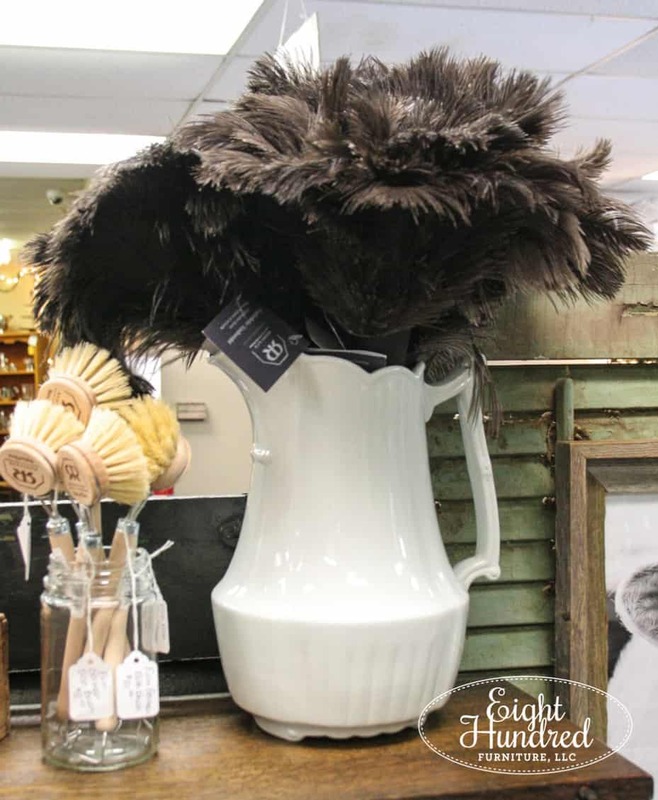 These ostrich feather dusters are not only pretty to look at, but they make dusting your home a breeze. I have two types of dish brushes. 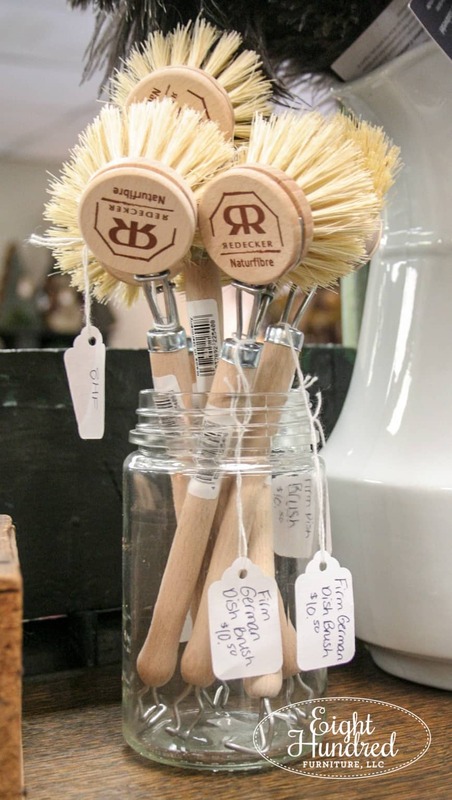 These yellow bristled brushes are for tougher scrubbing jobs. 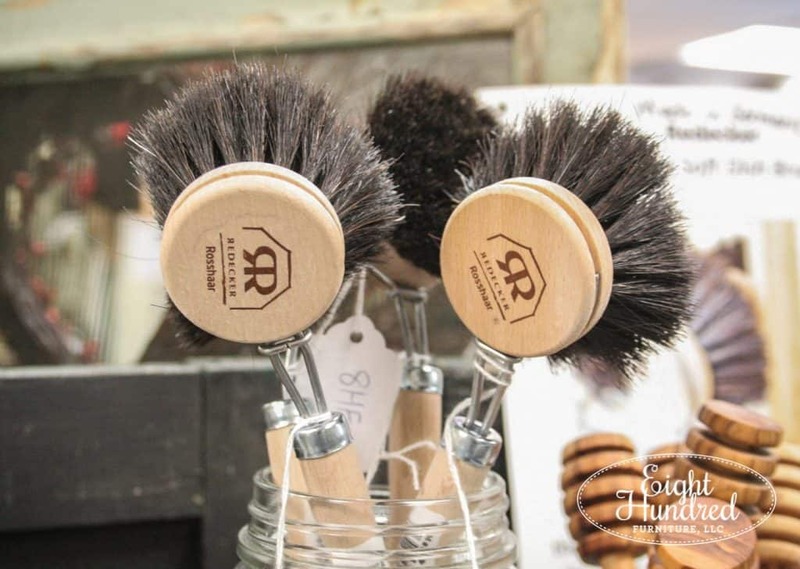 If you want something a little softer, try the black bristled brushes. I use them on my dishes at home and I absolutely love them! They’re much cleaner and more sanitary than using smelly old sponges. 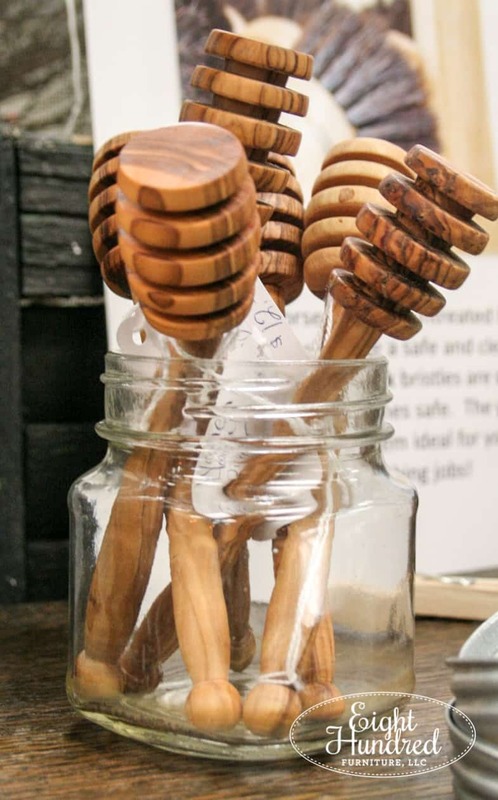 These wooden honey dippers have lovely marbling in the wood. I also have scrub brushes for your floors and carpet. Because I work out of my home, I have spilled my fair share of paint on our carpet. I grab one of these every time to get the stains out. 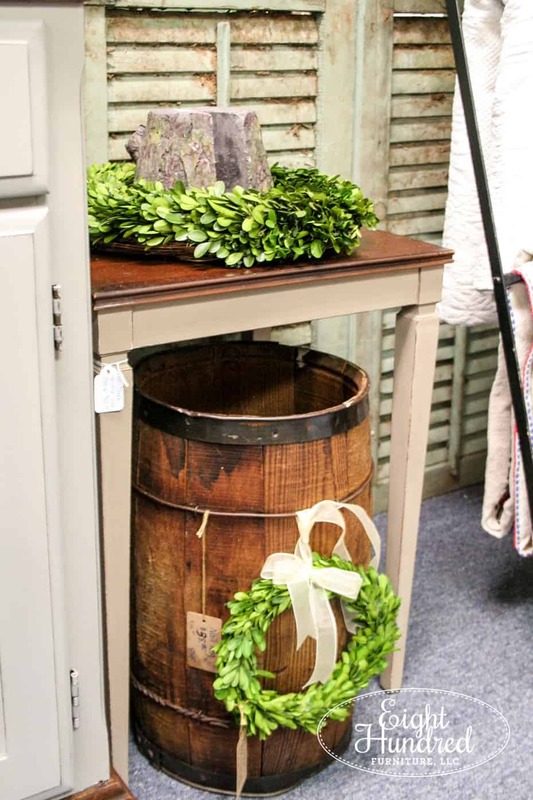 Next to the linens, I have a small end table that has been painted in Coco by Annie Sloan. The top has been refinished with Howard’s Restor-A-Finish. I also have a gorgeous old oval mirror with beveled glass. I snatched this up the moment I saw it. Doesn’t it look like the perfect mirror to check your hair before you walk out the door for the day? 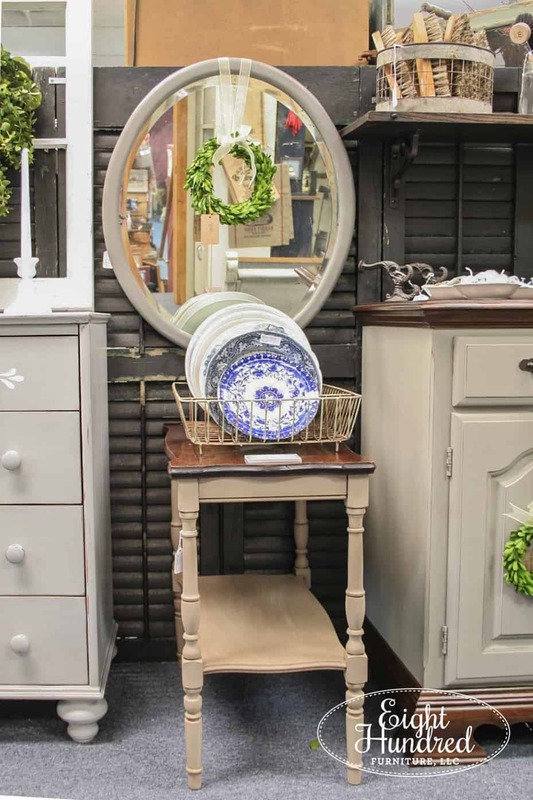 Nestled in the antique dish rack, I’ve got an assortment of ironstone and flow blue plates. They would make a killer plate wall! 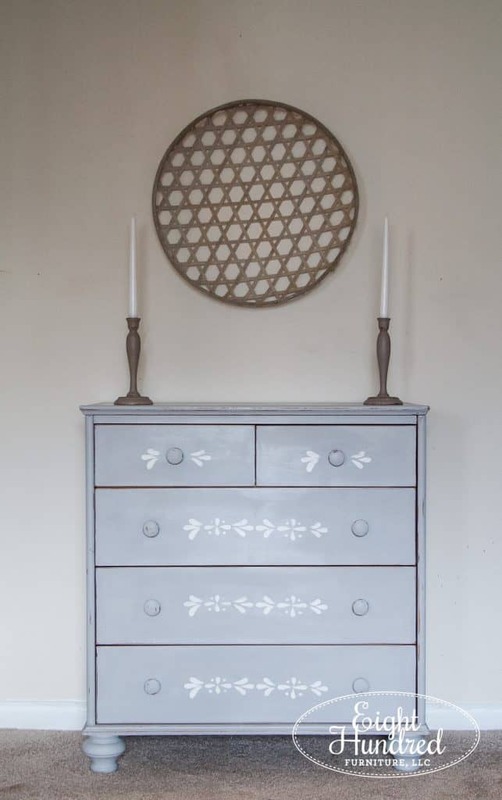 My “Nancy” stenciled chest is next to my mirror and dishes. You can read up on that makeover here and see more photos. My newest piece is this washstand. It’s been painted in MMSMP’s Eulalie’s Sky and trimmed with Linen. The top has been completely sanded down and stained with General Finishes’ Java Gel Stain. It has a satin finish so it’s not too shiny. Here’s a close up of that crackling and chipping. This piece is an old girl and each drawer has Knapp/Cove and Pin/Half Moon joinery. That automatically dates it between 1870 and 1900! If you like the knobs I used, you should check out my hardware stash. 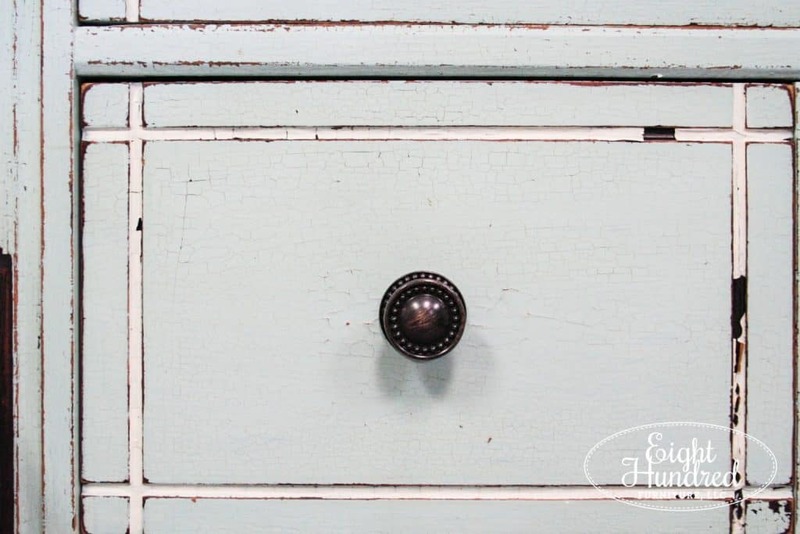 I’ve got lots of handles and knobs for you to choose from if you’re feeling inspired to paint a piece of your own. I went with darker knobs for this washstand to tie in the Java Gel stain of the top and the wood peeking through the chipping spots. Don’t worry though, this piece has been sealed in Tough Coat, so the chipping will not continue in your home. It’s all sealed in! Going down the aisle, I have four pieces in a row. My super cool Mexican pirate chest is on the end. You can read up on that makeover and see more photos here. 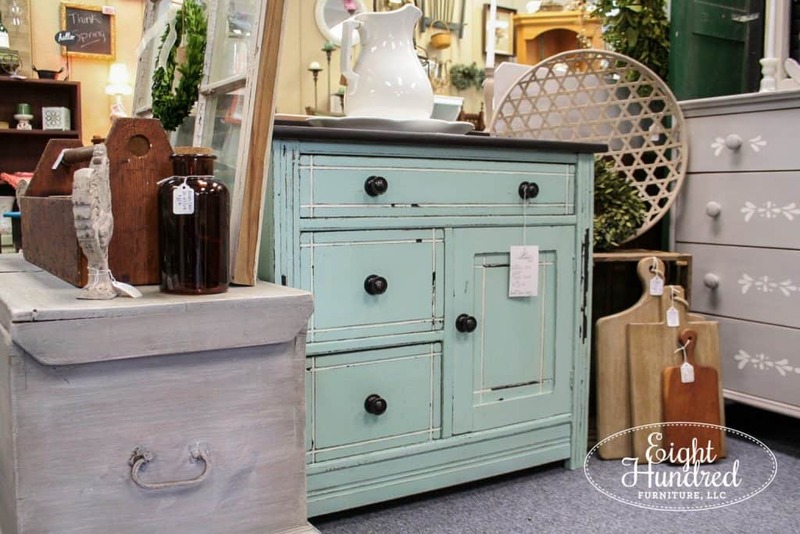 This chest would make a great coffee table, toy chest, blanket chest, or sit pretty at the foot of your bed. 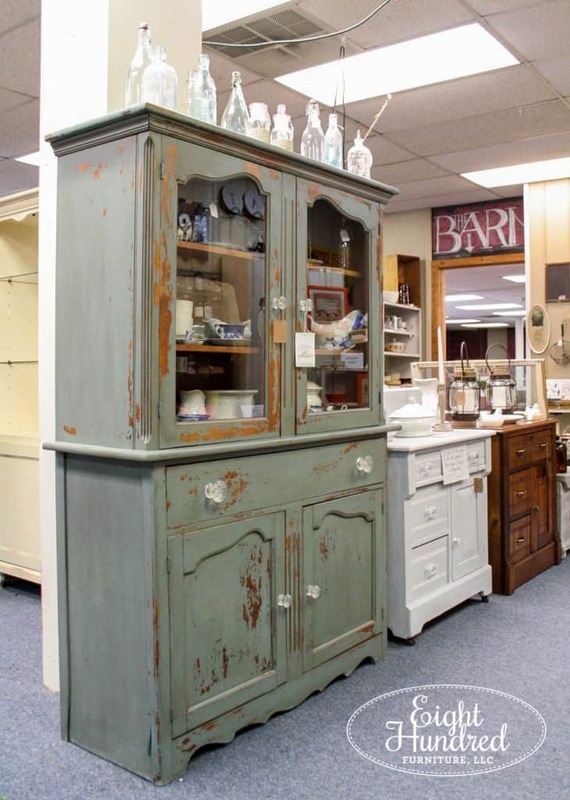 Finally, I have my Bergere Milk Painted cabinet that is currently storing my ironstone and flow blue goodies. 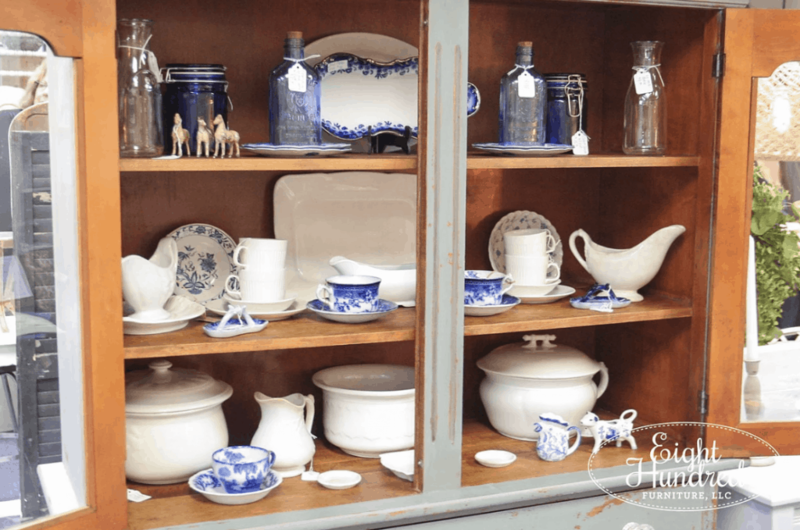 If you’re into earthenware and fine china, then you definitely need to stop and browse! This was another piece that happily chipped all on its own. I used some Antiquing Wax to give it a bit of age. My favorite parts are the curves on the door panels and the glass knobs. Here’s my space from up above so you can get an idea of what it looks like all together. I hope you come by soon to visit! 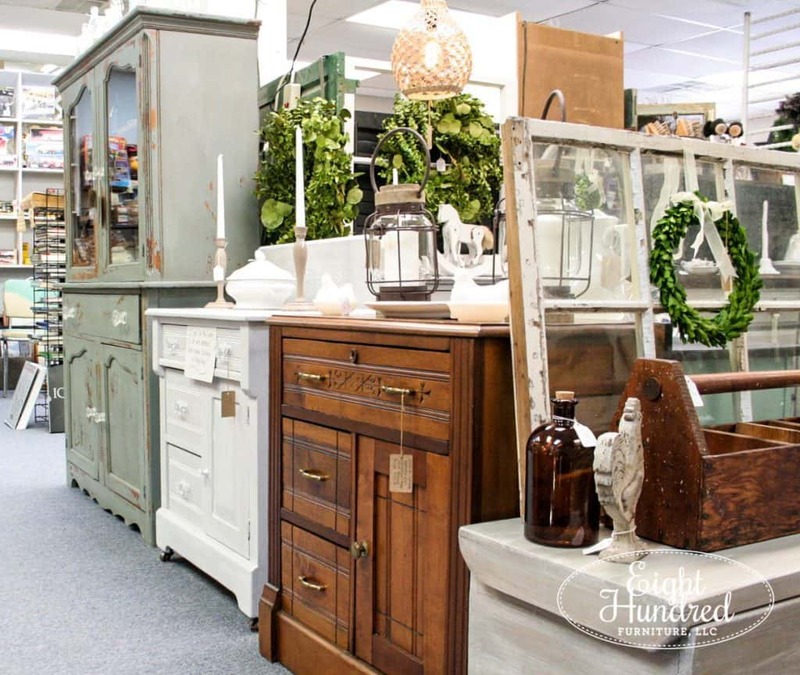 There are more exciting additions coming in the next few weeks, so make sure you stay tuned on social media for updates on workshops, demos, and new inventory!